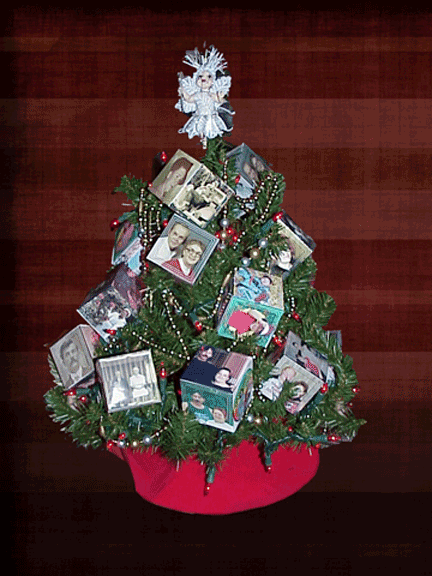 A fabulous use for family photos is to make simple cubes to put on your Christmas tree or even dangle from your rear view mirror. With the smart phones in hand filed with selfies that seem to get deleted when your phone gets filled or uploaded to social media. A great tradition would be to create a photo cube Christmas Ornament for each family member, each year, with the date on it . . . Printed on heavy photo paper or at any discount printer. They could even be mailed flat and assembled by the recipient. Depending on the number of vintage photos in your collection you can put all of one person on one cube or all of one family on a cube. You can use one of the panels to put the names, dates or information regarding the photos on the cube on one of the panels that will hang to the back or bottom. Either left as the simple folded box tucked among the branches as shown here on this small coffee table tree or embellished to suit each person your imagination is your only limitation.